According to the Washington Post, The Department of Energy estimates that awnings can reduce solar heat gain—the amount temperature rises because of sunshine—by as much as 65 percent on windows with southern exposures and 77 percent on those with western exposures. Your furniture will last longer, too. Geoffrey Donovan studied it in Sacramento, and calculated the savings. Virginia creeper and ivy have been known to grow quickly in the Greensboro climate, and they can greatly help with the coolness of your home this summer. With an energy efficient air conditioner, your energy savings will help you save money and stay cooler this summer. There are some other ways to stay cool, such as painting your roof a lighter color, using ceiling fans throughout your home and using your outside grill to cook hot foods instead of preparing them indoors. 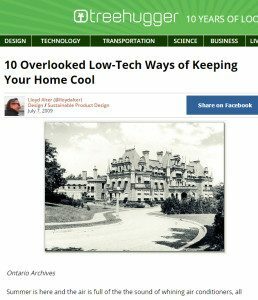 All of these techniques and tips will assist you with keeping your home comfortable and cooler this summer. At Berico Heating and Air Conditioning, we provide Greensboro AC maintenance so you can rely on your system the entire season and not need to make emergency repair phone calls or experience any downtime. Call us at 336-496-2509 to schedule your Greensboro air conditioning service today. Air Conditioning Repairs in Eden: Spring is the Ideal Time Do Greensboro Air Conditioners Create High Energy Bills?